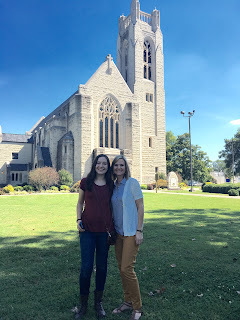 Just yesterday, I was dancing in the kitchen and bouncing my baby girl in my arms to Shania Twain's "Feel like a Woman" and today we embarked on our first college visit. Tonight I told her: "Stay home Pumpkin! Just don't go to college!" She just looked at me and laughed. For some reason, I don't think she agrees with me. to leave her mother and fly to college!